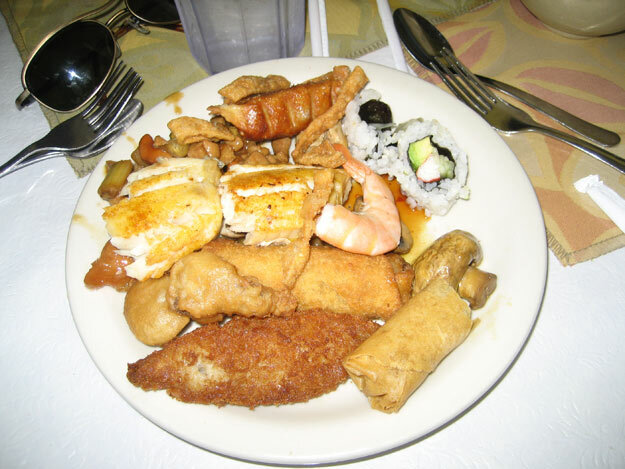 Royal Dragon offers a good though average Chinese buffet and some extraordinarily delicious a la carte items. I’m a bit late to the party. 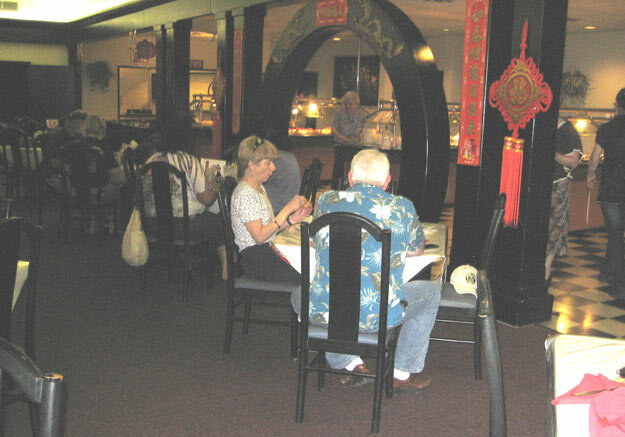 Royal Dragon’s been serving hungry Tulsans for 35 years. (The original owners, who ran it for over three decades, sold it a few years ago.) 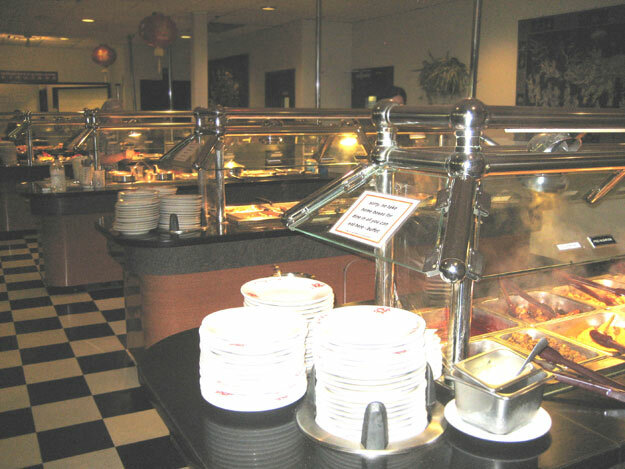 It was one of the first restaurants to offer a buffet option, and the overwhelming majority of diners pay their $9, walk through the pleasant, ornate dining room and head for the buffet beyond. I didn’t. 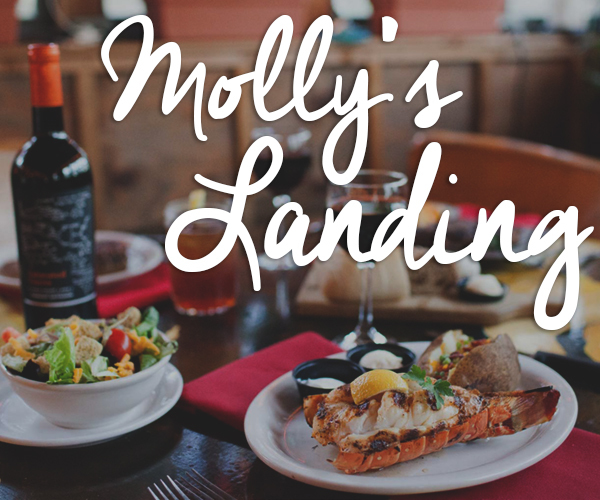 I wanted to try items from the long and enticing a la carte menu. I begged my friends to do the same. But they headed for the buffet. The menu had lots of tantalizing choices. Seafood hot pots, for instance, and beef on a sizzling iron platter. I ordered a whole steamed fish with scallion and ginger $15). That’s one of the few dishes that takes a long time to prepare. And so, for 20 minutes, I watched greedily as my pals came back with huge plates loaded with goodies. And then my revenge. 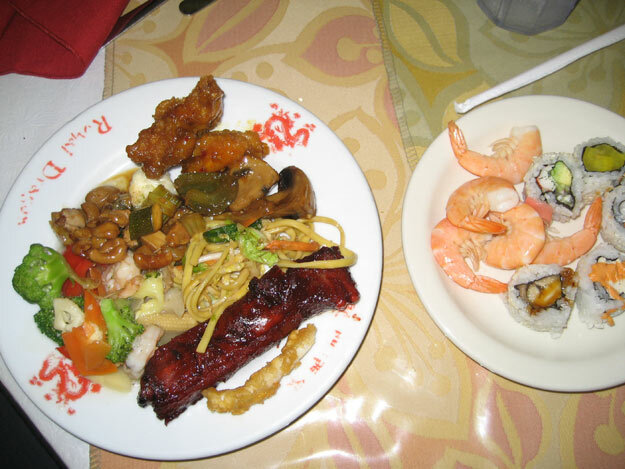 As they were finishing off their buffet selections, a waitress proudly carried a huge platter to the table. “That’s about the biggest dinner plate I’ve ever seen!” said Betty. It was my fish. Now one of those big glossy magazines recently had a big article about this blog, and they praised us Tulsafoodblog writers to the skies. They said we were ordinary affable folks who don’t know much about highbrow stuff like writing style but who do know good food and how to take photos. Now usually that just wouldn’t work. You have to garnish the photo with well-chosen words. But this fish was so spectacular that it would work here, I could just present the photo and say WOW. 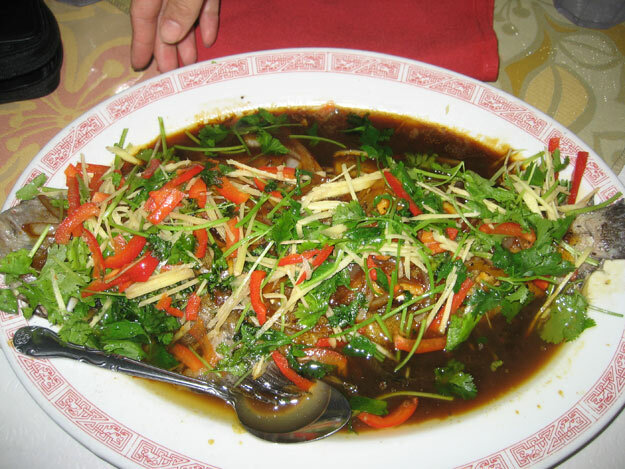 Under that tasty forest of scallions, ginger, peppers and cilantro was a very big fish. Whole, complete with head and tail (and, by the way, a lot of bones). 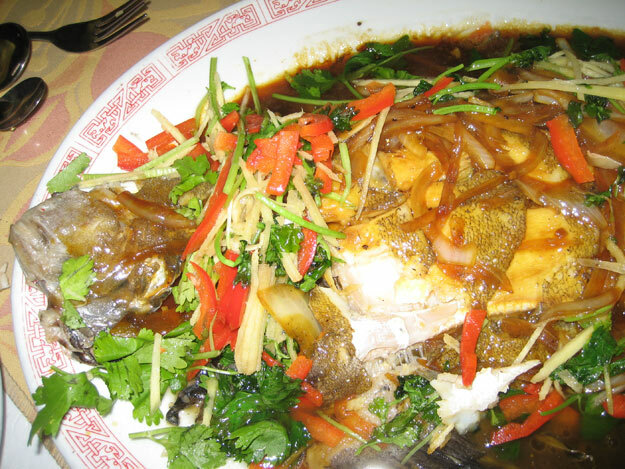 One waitress thought it was flounder but I think it might be croaker, which is very popular with Chinese in America because it is similar to Shanghai’s prized yellowfish. Whatever it was, it was a lovely fish. Slowly I savored every bite, filleting the center, picking out the bones from the sides, dipping each morsel into the lake of sauce, a simple (mostly soy and oil) yet tasty dipping sauce to which I slowly became addicted. The greenery accented the flavor of the fish and I ate every bit of that too. Before I did, I snapped another photo ot show you the fish close up. That’s the head on the left, and you can see some of the white meat. As I was eating, my friends raided the buffet tables again and came back with plates laden with ice cream, puddings, cookies, etc. I didn’t care. I had my fish. But in case you decide to go for the buffet option, let’s walk through to the buffet area. A big sparerib, noodles, veggies, sweet-and-sour something. And yes they have sushi and shrimp. 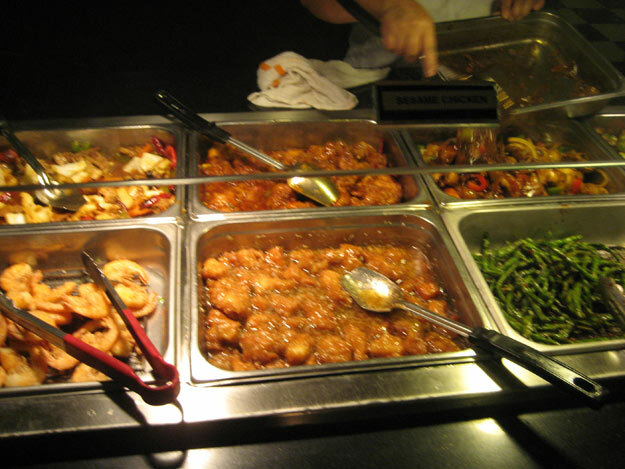 I wasn’t allowed to taste any of this since I didn’t pay for the buffet, but Cathe said it was pretty good, about average for a Chinese buffet. My other friend got this. Fried fish and shrimp and chicken wings, egg rolls too. A pretty good deal for $9. But, for me, to compare the buffet to the steamed whole fish would be like comparing mediocre street graffiti to the Mona Lisa. 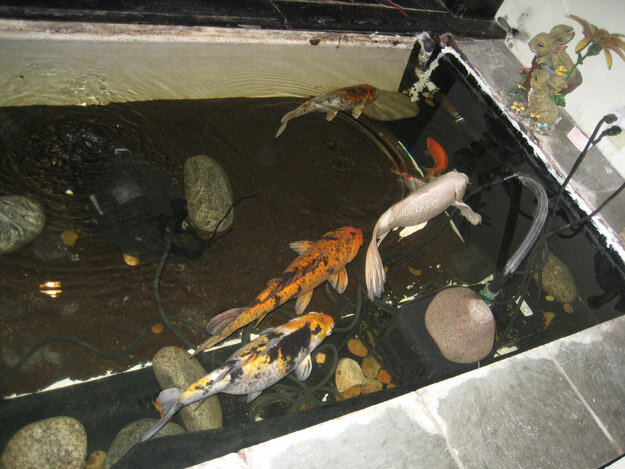 Whatever you order, don’t forget to look at the lovely fish pond on your way out!